Between 1945 and 1985, academics, artists, revolutionaries, and state functionaries in France spoke of transparency in pejorative terms. Associating it with the prying eyes of totalitarian governments, they undertook a critical project against it—in education, policing, social psychology, economic policy, and the management of information. 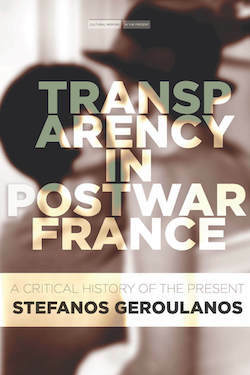 Focusing on Sartre, Lacan, Canguilhem, Lévi-Strauss, Leroi-Gourhan, Foucault, Derrida, and others, Transparency in Postwar France explores the work of ethicists, who proposed that individuals are transparent neither to each other nor to themselves, and philosophers, who clamored for new epistemological foundations. These decades saw the emergence of the colonial and phenomenological "other," the transformation of ideas of normality, and the effort to overcome Enlightenment-era humanisms and violence in the name of freedom. These thinkers' innovations remain centerpieces for any resistance to contemporary illusions that tolerate or enable power and social coercion. Event co-sponsored by the Maison Française, Society of Fellows and Heyman Center for the Humanities, and Columbia Center for Contemporary Critical Thought.